A&S Estate Sales of Oregon is a professional estate sales service provider that also specializes in moving sales, downsizing sales, business liquidations, consignments, and appraisals. We carry out sales mostly in the Portland, Oregon area – Beaverton, Gresham, Tigard, Hillsboro, Clackamas, Happy Valley, Milwaukie, Gladstone, Oregon City, West Linn, Lake Oswego, Wilsonville, and Vancouver - but we are able to travel elsewhere in the state. We do. And we maximize results! We encourage you to have a look at our past sales and the reviews left by previous clients. Amazing 40-year collection of Art Deco collectibles and antiques!!! We are unpacking boxes now - more photos to come soon (as of October 8th). We have run this sale for 6 days - we’re going into the 7th day now and everything is 50% OFF.Here’s what’s leftover as of the end of the day August 2nd. This sale started on Friday and is continuing thru Sunday! Everything must go by the end of the weekend!Please see our website for more details! MASSIVE KING CITY ESTATE SALE!! 75% off Mega Antiques and Collectibles Estate Sale!!! This is going to be a nice small sale with some great tools. Full description and many more photos coming soon! This company has posted a total of 100 estate sales. Only the most recent 50 sales are shown. I would like to highly recommend A&S Estate Sales to any business or individual looking for help with a liquidation sale. Arnie and his amazing team worked with us for over a month when we wrapped our 6 year television series in Portland. Our needs were quite different than most of Arnie's previous clients, but that didn't faze him at all....he skillfully rose to the challenge. When Grimm finished shooting in January 2017, we were left with several large warehouses of furniture, props, costumes and equipment that we needed to liquidate quickly and efficiently. A&S came to our rescue. Besides organizing an enormous volume of stock and handling the logistics of turning a commercial warehouse into a public sale space, A&S also had to deal with "input" from crewmembers, landlords, lawyers, publicists, reporters and even the fire marshall. Arnie's team was respectful and attentive to everyone's issues while continuing to focus on their main task of setting up the sale. On the first morning of the 9 day sale, there were over 1000 people waiting in line when the doors opened. I don't think I've ever seen anyone work harder than the teams Arnie had assembled to handle the sales, service and security. At the end of the 9 days, the formerly "packed from floor-to-ceiling on all three floors" warehouse was completely empty and spotlessly clean. It was unbelievable! No matter how small or large your sale will be, you'll be in good hands with A&S. We hired A & S Estate Sales of Oregon last November when we sold our family home of 4 generations. Arnie and Sura are wonderful people and a pleasure to do business with. They are professional, knowledgeable, reliable, honest and hard working. Arnie took the time to research, authenticate and price a large number of books, pieces of art, antique maps and rugs. The sale items were organized and displayed beautifully in the house and proper advertising guaranteed buyers. Arnie and his team were so kind and respectful of the family working( at times right alongside Arnie) to pack and move out of a treasured family home. Arnie's estimate of the estate sale value and work required for the sale was completely realistic. The two day sale was a success and Arnie left the house empty and broom swept as promised. We would highly recommend A & S Estate Sales of Oregon! The best! Went to one of their estate sales this weekend and was so impressed. Great organization, well staffed with friendly people and very reasonable prices. As I am a dealer I frequent sales and this one could not have been better. Can't wait for their next sale. On 12 May 2016 I contacted A&S Estate Sales of Oregon and spoke with Arnie Valdivia to see whether he handled sales of wood working tools. He said he did so we made a date for the next day for him to come look over the shop in our house. He arrived promptly and after looking over the voluminous (but orderly) collection of small and larger machines and hand tools it was agreed that he would do the sale. 10 or so days later he spent two to three days going through everything, organizing and pricing, with the one day sale being held on 28 May. Arnie had arranged for publicity, and almost everything sold. The following day he returned to do the final cleanup and take away those items that had not sold so that he could try to sell them elsewhere. At the first of August I received a check in the mail from A&S Estate Sales for these final items. Arne was a pleasure to work with, friendly, low key and calm. He showed up when he said he would, and if he was going to be late he always called to let me know. He has a nice family too; his wife and aunt came with him on the day before the sale to help out. I highly recommend his services. "My house sold much faster than I expected, so I needed an estate sale company to quickly help take care of the furniture and other items in my house. A&S was recommended and I can see why from the amazing job they did with such short notice. Arnie and Sura are very efficient and organized. They fully sorted and evaluated all the items in my house, and thoroughly investigated item values to ensure the best prices. I was amazed at how quickly they organized everything, and the way they set up and arranged things to showcase each item in the most attractive way possible. They widely advertised the sale (over Thanksgiving weekend) and a huge number of people attended. Everything sold! Wow! And then they thoroughly cleaned my house. Much thanks! They are highly recommended!" We hired A & S Estate Sales to help us downsize from our home of 28 years to an RV. We were on a tight schedule and they were able to get the job done in a timely and professional manner. It was such a relief to have Arnie and his crew take care of all the sorting, pricing and set up not to mention conducting the 2 day sale, donation of unsold items and clean up. A & S did an excellent job and we would highly recommend them for you Estate Sale and downsizing needs. They did an amazing job! We had a large home, barn and shed with 70 years and 4 + generations of collectables and "stuff". They organized, and displayed the best possible way , given the amount of things. We had people come back for days to tell us how knowledgeable, and helpful they were. Arnie and his staff went the extra mile. When they started the process of organizing, he called and told us there were too many things to attempt to do the sale justice in the weekend we were hoping for, so we set it for another weekend. It was well worth the wait! I would highly recommend Arnie and his staff to care for your treasures as they move to someone else. Arnie and his staff helped with the donation of the items we didn't sell and kept the house nicely clean throughout the whole process . A special thanks to all. We could NOT have done it without you . We hired Arnie and A & S Estate Sales of Oregon to handle a business liquidation sale for one of our former retail tenants. From the start we could sense Arnie’s enthusiasm and excitement about the project. As part of our requirements for the liquidation, we also hired Arnie to provide us a detailed list of every item the tenant left behind. Arnie organized the items, carefully documented everything and prepared the location for the sale. During those four days, his knowledge and professionalism shined through. The day of the sale he not only effectively and efficiently managed the number of customers that attended the liquidation, he kept his finger on the pulse of the sale the entire time. There is no doubt that Arnie made the process seamless, saved us time and brought in more money than we expected. Arnie and his staff exceeded our expectations. 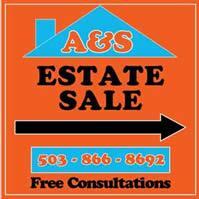 We highly recommend Arnie and A & S Estate Sales of Oregon to liquidate your home or business. "My wife and I go to a lot of estate sales and appreciate ones that are organized and run by knowledgeable people. This describes Arnie, his wife and crew perfectly. Arnie especially knows the value of antiques and collectibles…what they would be worth at auction, in antique store and at an estate sale. As a result, prices set at A&S are realistic…fair both to the estate and to buyers. And just one more thing, you won't find a nicer, more service oriented group of people anywhere. When we're ready to downsize in a few years, I know we'll be in good hands with A&S Estate Sales!" "Recently I moved from Vancouver,Washington to Phoenix, AZ. Downsizing my home made sense but I could not have an estate sale at the condo development where I was currently living. A&S Estate Sales,and Arnie Valdiva in particular,came to my rescue and made the downsizing possible. Arnie and his professional team picked up by furniture and belongings and promptly sold them at a combined estate sale. This reduced my moving expenses and allowed a profit from the sale of my possessions that was greater than I expected. A&S Estate Sales did an excellent and very timely job in helping me downsize. I would recommend A&S Estate Sales to anyone considering an estate sale. Arnie and his team know the value of they items they sale, present them in a professional manner and are completely ethical in their transactions." "We are extremely happy with the hard work and the professional way in which Arnie and his wife helped us. Being from out of town, we didn't know where to turn for assistance until we talked with A & S Estate Sales. They sold 3 storage units of estate items for us. We had no idea how to do it until they figured it out. A & S is honest, punctual, resourceful, and inventive. We were really thankful for Arnie's help." "Our mother and father had been collecting treasures for over 50 years. Their 5,000 square foot home was full of antiques and primitives. Some of the one-of-a-kind handcrafted pieces had been designed by our artistic father. Our family knew we would not do justice to the items with a simple sale. We needed help. A & S Estate Sales of Oregon was interviewed and selected and we know we made the right choice. Arnie and Sura spent weeks inventorying and researching the items. They interviewed family members about the piece’s history: “Who made it? When was it made? How long has it been in the family?” On line research was done to evaluate and compare for pricing. As they worked, we felt they respected our family’s feelings and property. They were very thorough. Pictures, coins, and family mementoes were uncovered and returned. Questions we had before and after the sale were always answered and phone calls and e-mails were promptly returned. Our family’s home was clean after the sale with floors vacuumed and garbage removed. Letting go is stressful, but Arnie and Sura have helped with the transition. We would recommend A & S Estate Sales of Oregon." "We hired A&S Estate Sales to handle our downsizing sale prior to an international move. Arnie and his team were a pleasure to work with. Their flexibility, communication, and thoroughness was greatly appreciated during that stressful period. The proceeds of our sale were above our expectations and the value of the service was immeasurable! We would absolutely recommend A&S to family and friends for any future sales." "A&S Estate Sales of Oregon did an outstanding job with my mothers big mess of an estate sale. Arnie was very professional and personable. I called a few other agents, one didn't want it because it wasn't full of expensive furniture and 2 others never returned my calls. Arnie picked up on and was on on the ball until the last day. He worked very hard to get top dollar for everything and did sell at least 90%. In the end he also removed the rest and donated it all which was a huge help & relief. He also answered or returned every call & text within a short period of time. His staff was nice and helpful as well. Using A & S Estate Sales made this difficult time for me a very easy process. Trustworthy, kind, hard working and very easy to talk to. I will recommend him/them to any and all who ask!! I want to thank you and all your team for the outstanding job you did for my client, Odeine Talbert, on her estate sale last month. She is elderly and has lived in the home a long time and there was so much sorting and organization needed before the sale could take place. You and your team handled it all efficiently and thoroughly. The sale was handled very professionally with the owner getting a profit greater than she expected too! Thank you also for leaving the property completely tidied and clean, with all remaining trash and unsold items removed quickly and completely. I would be very willing to recommend you and your company to my future clients in need of this service. It was the best run estate sale I have ever seen. You are great. Thank you for an excellent job."